Prepare the bok choy by separating the white stems from the leafy portion. Slice the whites lengthwise into thin strips and set aside for the tofu noodles. Coarsely chop the leafy portion cross-wise and set aside for the soup. 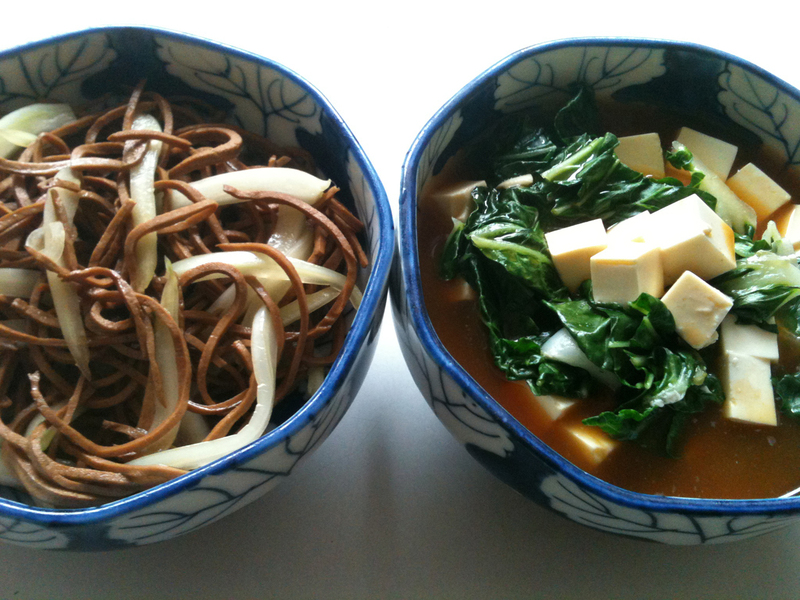 Place the tofu noodles for 30 second in boiling water. Drain and pat dry. Saute the sliced bok choy whites with the garlic on high heat for 1 minute. Remove the garlic. Combine tofu noodles, bokchoy, sesame oil, in a bowl and add salt and chopped cilantro to taste. Prepare the soup: combine the shrimp and chicken broth and bring to a boil. Add the leafy portion of the bok choy, tofu and simmer for five minutes. The bok choy should be bright green. Season with salt, pepper and cilantro to taste. Ladle into bowls and serve immediately. This is a recipe (actually, 2) inspired by my friend Ling ling who manages to put an inventive and tasty preparation of tofu on the table almost everytime I visit. The tofu noodles (gansi) can be found in Chinese supermarkets in the refrigerated aisle and is found in both plain (white) form and with five-spice flavor (as used in this dish). A more classical preparation of this dish uses sliced celery, but I had bokchoy on my hands and used that instead. Plus, using only the leafy portion of the bokchoy gives a more compatible texture with the softness of the tofu and offers a great visual contrast to the white of the tofu.